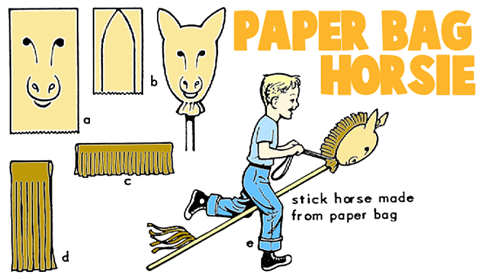 To make this toy horse, you will need 1 broomstick, 2 paper bags, old newspapers, string, 2 pieces of brown crepe paper (1 piece 6"x12" and 1 piece 8"x12"), crayons, 6 thumbtacks, glue, 24" of lightweight rope, and scissors. Draw a horse's face on the paper bag (see sketch a). 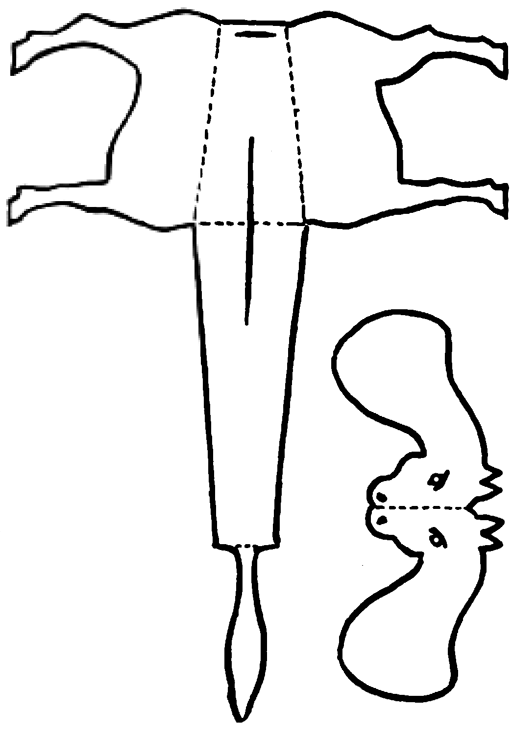 Cut two ears from the other paper bag (see sketch b). Glue these in place on the horse's head. Stuff the paper bag with newspapers, allowing room for the broomstick to fit into the horse's head. Tie bag securely to broomstick. Fold the 6"x12" piece of paper lengthwise and fringe for mane as shown in sketch c. Glue to horse's head (sketch c) , then tack to broomstick any portion extending beyond paper bag. Fold the other piece of crepe paper and cut lengthwise (sketch d) to make the tail. Tack 12" above end of broomstick, opposite head. Attach rope for reins. 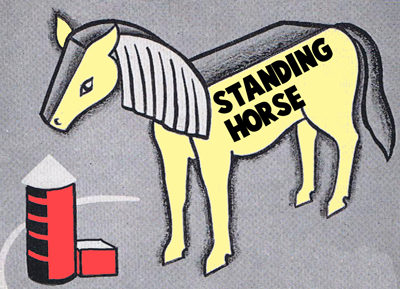 This craft is to make a paper rocking horse that really works. 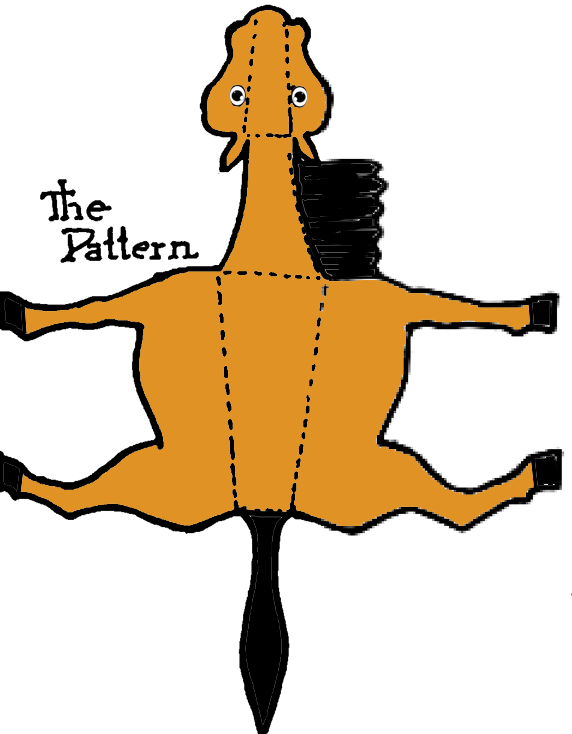 Print this pattern for this small rocking horse. Either paste it on cardboard or make a copy of it and then trace your pattern on a sheet of lightweight cardboard. Cut out. 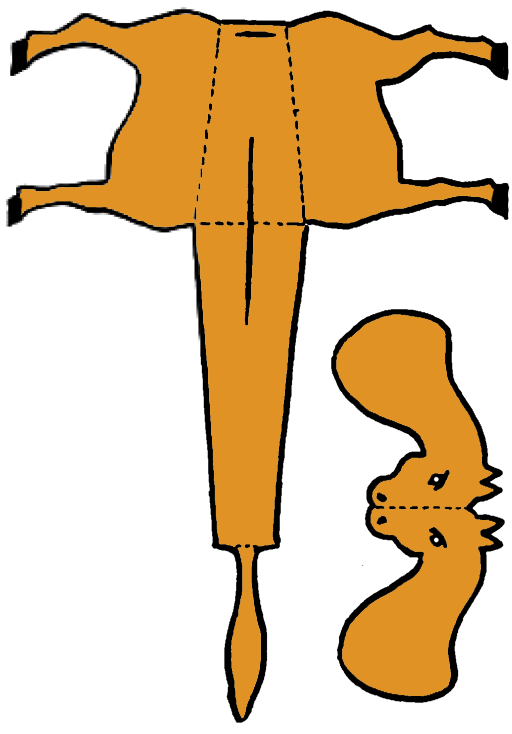 Fold the cut-out double horse in half so that the 2 sides match. 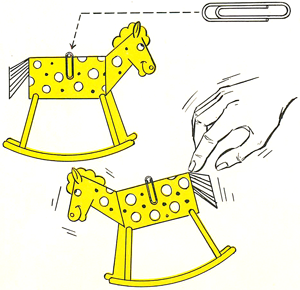 Fasten the 2 sides of the horse's back together with a paper clip. Bend the base up between the rounded ends of the rockers. Give the small rocking horse a gentle push. It will start rocking back and forth. (Parental Help Probably Needed) Stuff a large white sock with cotton as full as possible from heel to toe. Push a discarded broomstick all the way to the heel and pack cotton around it to make the neck. Then tie it on securely with string. Add two black buttons for eyes, and sew in place two small pieces of felt for ears. Make a bridle by sewing or gluing on buttons and gluing brightly colored ribbon on the face. Then braid a long strip of yarn for the reins, and fasten this across the toe of the sock. Cut plenty of yarn in 6-inch strips for a heavy mane, and glue or sew this in place along the seam of the sock. Heavy brown paper, cut in strips, also makes a good mane. 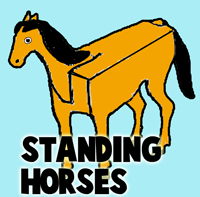 In order to make stand-up paper model horses, you can download them here. Here is a black and white version and a color version of the first horse above. Here is a black and white version and a color version of the second horse above. 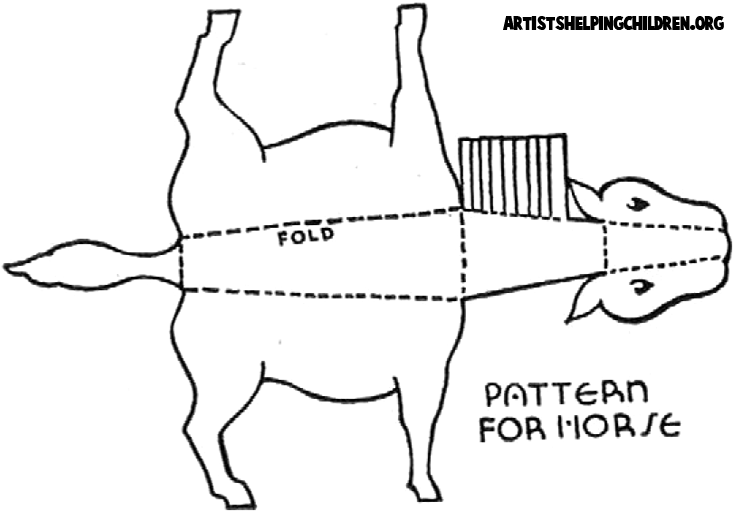 Just print one out, cut it out and then for the first horse above, just fold on the dotted lines. 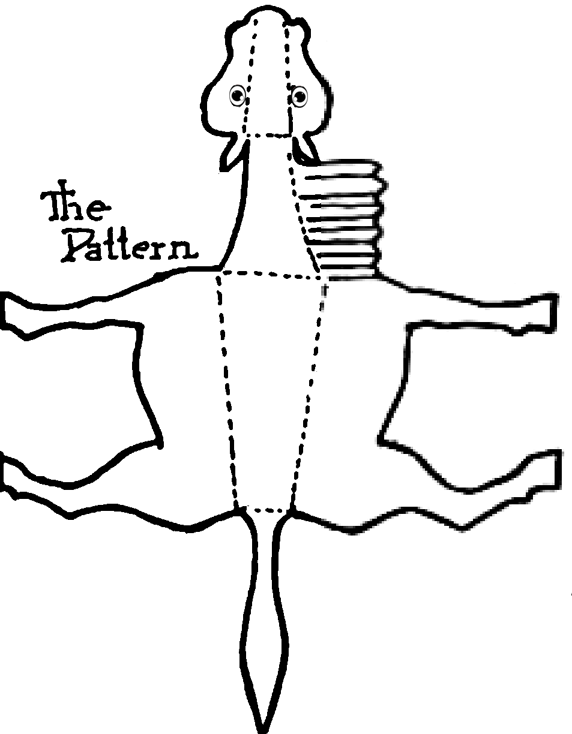 For the second horse model, first cut the slit and place the head in there, and then fold ont he dotted lines. 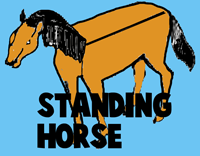 And here is another paper model horse that you can print out and fold. This one is super easy to make and fold compared to the other horses though. Here is the template. 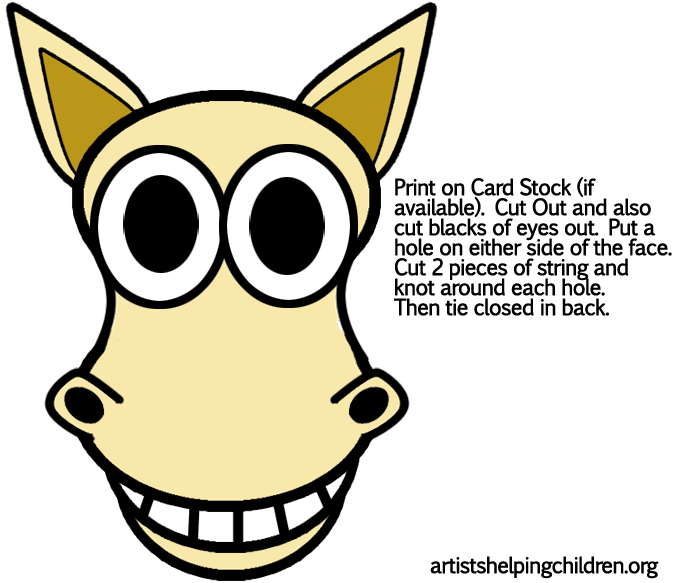 To make teh above horse mask, just print out our paper horse mask template and follow the instructions on that page. (Parental Help Probably Required) Make a horse's head from a man's work sock. Cut ears from felt and 'use buttons for eyes. Stuff sock with shredded nylon hose or cotton filler. Tack to broomstick after securing it tightly around cuff with a fringed piece of red oilcloth, cloth or plastic. OR for an easier solution tie it closed with string. Use an 8" length of upholstery fringe 1 1/2" to 2" wide for the mane and sew to head. Use two yards 1/2"-wide heavy red ribbon for the harness. For tail, use rug warp or frayed hemp rope dyed to match mane. Tack a 12" length one foot above end of broomstick. This is a fun horse to make and keep forever. Collect the following items....some modeling clay, poster paints; brush; newspapers; and toothpicks. Spread newspapers out to protect your counters or table and make the above horse as directed. When dry, you can paint with the colorful paints. Do the following ... Knead the modeling clay and roll it into large balls (picture 1). Now break the modeling clay it into smaller pieces (picture 2). Mold into shapes of legs and bodies (picture 3). Now form the horse by putting the body parts together (picture 4). (Toothpicks may be stuck through the legs and into bodies to hold animals together.) Use toothpicks to draw in horse's features (picture 5) .Allow to dry thoroughly (picture 6). 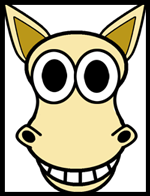 To learn how to draw realistic and cartoon-style horses, pick one of the thumbnail pictures above to follow that lesson. Wooden Spoon Horses - Make this cool model horse out of ice cream wooden spoons. Rocking Horse Paper Toy Model - Find out how to make this rocking horse toy out of paper. Styrofoam Pipe Cleaner Horses - Make these horses from yarn, pipe cleaners, and styrofoam cylinders. 3D Traveling Circus Paper Model - Cut out and fold up this horse-drawn circus lion cage and wagon. Oatmeal Box Rocking Horse for Your Doll - Even dolls get bored, make this rocking horse out of an oatmeal container, cardboard, a mail tube, ribbon, and a few other items. Paper Bag Headed Hobby Horses - Find out how to make this hobby horse made with a large paper bag, yarn mane, string reins, and a broomstick as the stick to place the head on.